It appears something is brewing between actors Salman Khan and Katrina Kaif. 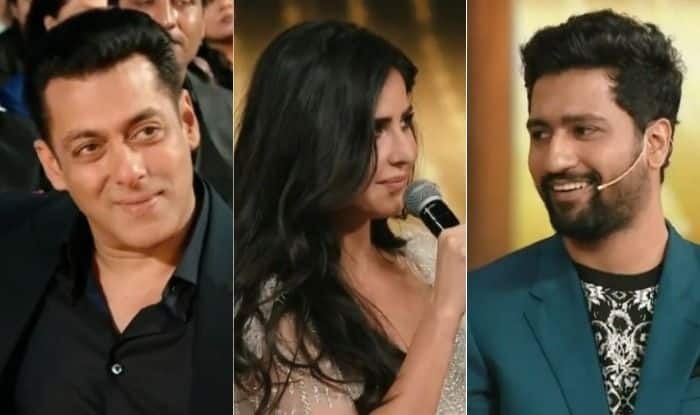 It appears something is brewing between actors Salman Khan and Katrina Kaif, going by the reaction of the former when actor Vicky Kaushal made a marriage proposal to the latter at the Star Screen Awards 2018. The event, which was aired on December 31, had a good number of stars in attendance, and Vicky had played host along with actor Ayushmann Khurrana for most part of the show. When Katrina came on stage, a star-struck Vicky admitted to being a big fan of hers and proposed to her. The clip, which showed Vicky interacting with Katrina, also focused on Salman, who was seated with the audience. Vicky started off by telling Katrina that he is a big fan of hers, and then asking her why she does not find someone as good as him to get married to. The question surprised Katrina and when the camera panned to Salman, he could be seen smiling in response to the question. Vicky went on to say that since it is the wedding season he thought he might as well ask her, and Katrina, who pretended to not understand what he was saying, asked him what he wanted to ask. And while the popular song Mujhse Shaadi Karogi, which features Salman, was playing in the background, Vicky popped the question. The reaction Salman gave is worth seeing. Katrina and Salman were once in a relationship, and the two have remained friends after parting ways. They have also starred together in movies, with the last being Tiger Zinda Hai. They will also be seen next in family drama Bharat.